I had come to the Glee Club mainly to see Loney, Dear but this turned out to be one of those rare shows where the support act outshines the headliners. Snowbird are fronted by Stephanie Dosen, whom I have never encountered before, but it seems she has put out a couple of records under her own name and, if her website is to be believed, she grew up on a peacock farm where she had a swan and a fox as pets. (She gives no details about how she prevented one pet from eating the other.) She resembles a young Courtney Love, but minus the aggression. In fact, Stephanie turns out to be one of the most twee people you could hope to meet. Her beautiful voice and haunting songs put me in mind of Marissa Nadler (who is also playing at the Glee Club in the coming weeks) and she soon has everyone spellbound with the stories she tells between the songs, particularly when she explains that one song was inspired by getting insects caught in her false eyelashes. These surreal anecdotes remind me why Kristin Hersh's solo gigs are such an endearing experience, and anyone who knows me will probably be aware that comparing someone to Kristin is not something I would do lightly. Stephanie is backed by a nondescript middle-aged man playing keyboards. He seems to be content to sit at the back of the stage and let her take the limelight, and it's only halfway through the set when I glance at the venue's flyer left on my seat that I discover he is in fact... Simon Raymonde! Some of you probably know that amongst my various visual and physical awareness problems, I struggle with facial recognition and often identify people by their hair. 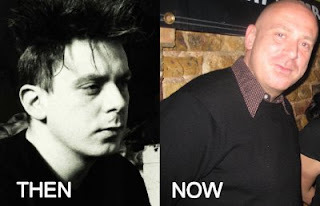 Despite his prominence over the last few years with his Bella Union label, I don't think I've seen a recent picture of Simon and the image I will always have of him is from the photos of the classic Cocteau Twins line-up of the 1980s. In those days, he had quite recognisable hair, but obviously not much of that remains 25 years later. I feel rather ashamed when it becomes apparent that for about 30 minutes I've been watching a man who made a major contribution to my record collection, without actually realising who he is. After the intermission, what we get from Loney, Dear is perhaps the worst kind of show as far as writing a review is concerned. It's pleasant enough but doesn't really inspire me to say anything good or bad about it. In fact, if it hadn't been for the opening act and the shock of seeing Simon Raymonde, I probably wouldn't be writing this at all. Loney, Dear is the project of Emil Svanängen from Sweden. I first saw him at the Iceland Airwaves festival a couple of years ago and enjoyed his set so I bought the album he had out at the time, "Loney, Noir". This album featured a number of sparse folk songs, reminiscent in places of Simon and Garfunkel. (I realise it's probably never been cool to like Simon and Garfunkel, but my dad was a big fan so they played a part in my musical upbringing.) I've listened to his latest release, "Dear John", a few times prior to the show, but it's made little impression on me. In fact if I'm honest, I wouldn't have bothered with the gig if the venue hadn't been offering free tickets. The set gets off to a reasonable start with "I Was Only Going Out", the most memorable song from the new album, sounding a bit like fellow Swede Jens Lekman. However, much of what follows just blurs into one and I find that I can't remember many of the songs within ten minutes of leaving the show. This may be down to the use of a full band; the drums in particular seem to dominate, making it hard to focus on Emil's singing. This is highlighted during a couple of rare delicate moments, particularly during one song that Emil performs without the band or even a microphone, relying on just his naked voice. The final encore of "Sinister In A State Of Hope" (perhaps the best song from the "Loney, Noir" album), where the band tone down their contribution, is also very effective and this leads me to the conclusion that the songs on the new album would be better if they were stripped down and played with just an acoustic guitar. I don't want to write Loney, Dear off completely and I will persevere with the album to see if I can uncover the true heart of the songs beneath their excessive instrumentation. But if you want to check out Emil Svanängen's work then I suggest ignoring "Dear John" and getting "Loney, Noir" instead.